The biggest names in Macao's gaming business are pulling out all the stops in the enclave's push to recast its image to become one of the region's top resort-and-entertainment hubs with an eye on the mass consumer market. The rejig has been well coordinated with a dramatic rebound in the casino mecca's fortunes following one of the chilliest "winters" on record sparked by a massive crackdown on graft on the Chinese mainland that had kept high rollers at bay. Macao's bid to diversify itself has also been given greater relevance as regional competitors, notably Vietnam, South Korea and the Philippines, up the stakes with the opening of a string of plush casino resorts in the past few years, with more on the cards. MGM Resorts China - one of the six licensed casino operators in Macao and a joint venture between MGM Resorts International and Pansy Ho Chiu-king - threw open the doors of its resplendent $3.4-billion MGM Cotai casino resort earlier this year, joining the ranks of the group's flagship MGM Macau (formerly MGM Grand Macau) that has been operating in the peninsula area of Macau since 2007. 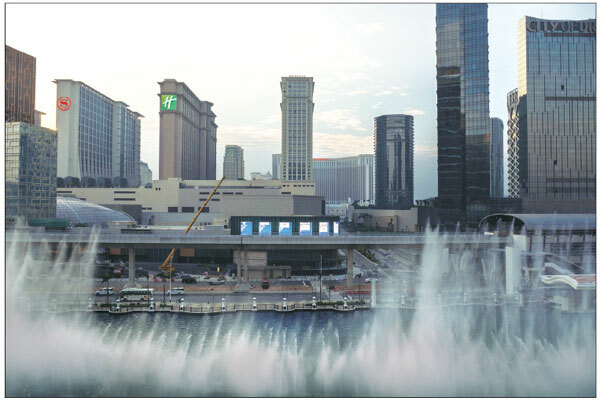 MGM Cotai's launch adds another spark to the escalating tug-of-war along the Cotai Strip - Macao's answer to the famed Las Vegas Strip - offering non-gaming themed attractions to lure more mass-market consumers rather than hard-core baccarat or poker enthusiasts. Cotai currently boasts some 10 major hotel-and-casino resorts, including the iconic Venetian Macao - the largest casino in the world and one of the earliest settlers on the Cotai Strip - Sands Cotai Central, both run by Sands China; Wynn Palace Cotai operated by Wynn Resorts; the Parisian Macao owned by Las Vegas Sands and newcomer MGM Cotai. Casinos in the gambling enclave took a hit in 2014 and 2015 as the mainland's war on corruption swung into top gear, reducing the number of big-time gamblers to a trickle. The sector has staged a strong comeback since 2016 as the city put on a more diversified marketplace facade. According to Macao's Gaming Inspection and Coordination Bureau, casino revenues stormed past market expectations in January this year with a staggering 36.4-percent leap year-on-year, and maintained an above 20 percent growth rate in February and March, recording 20 consecutive months of gains. Stocks of Macao's biggest casino operators listed in Hong Kong rose across the board. Wynn Resorts saw its share price jump three-fold - from around HK$60 in late 2015 to some HK$180 this April. "I think the anti-corruption campaign is a good thing. It offers an opportunity for all of us to go back and reassess where the market is headed and what consumer expectations will be," Grant Bowie, chief executive of MGM China, told China Daily. "Perhaps, in the past, we had gone slightly overboard emphasizing gaming. If you look at our new property, it has seen a significant increase in non-gaming activities." He said MGM China's income from the non-gaming sector now takes up nearly 30 percent of its total revenue - a huge increase compared to 15 years ago when it was less than 4 percent. 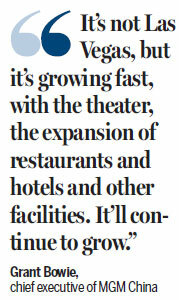 "It's not Las Vegas, but it's growing fast, with the theater, the expansion of restaurants and hotels and other facilities. It'll continue to grow." The hospitality and entertainment provider, whose parent company MGM Resorts International operates casinos across the globe, has more than 65 percent of its revenue generated from the non-gaming sector in its casinos in Las Vegas. Gary Monaghan, Fidelity International's investment director in Hong Kong, said Macao's non-gaming business is much smaller than that of Las Vegas as tourists to Macao are dominated by those from the mainland who are largely infatuated with the casinos. However, a few things are happening - consumer tastes are changing and they are looking for other things to do, said Monaghan, adding that a number of Macao casinos are looking at becoming integrated resorts that also offer shows, exhibitions, food and retailing with the hope that customers may end up staying extra nights and ultimately spending more. 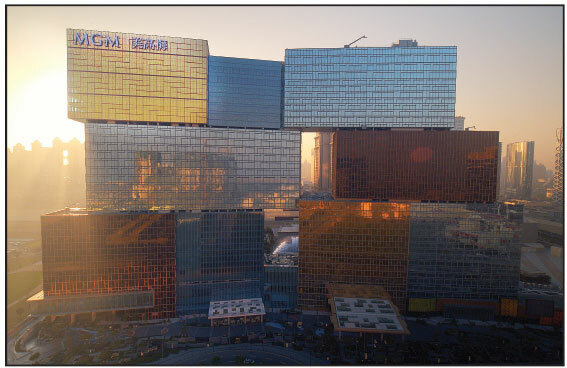 MGM Cotai has 1,390 hotel rooms - more than double that of MGM Macau. One hurdle for Macao is its limited number of hotel rooms, reckoned Monaghan. Thus opening new quality resorts is conducive to the whole sector. Recent years have seen key regional competitors, such as Vietnam, South Korea and the Philippines, opening up an array of opulent casino resorts to lure Chinese consumers. Adding to the apprehension of Macao casino operators has been talk that the central government might eventually legalize gambling on the island province of Hainan, which has been having its fair share of offering top-market holiday resorts and hosting high-profile international conferences and beauty pageants. "I have heard, probably 25 times, that gambling may be allowed in Hainan," said Bowie, while shrugging off fears that Hainan would be a threat to Macao. "Gambling is still a very sensitive issue on the mainland," he quipped. MGM China, he said, would be interested in investing in Hainan if gaming were to be allowed there and with all the infrastructures in place. Bowie emphasized that they do respect mainland regulations and would be happy to cooperate with the central government, but would not push for a relaxation of gambling curbs in mainland cities. He reiterated that mainland customers remain at the heart of MGM's business strategy, and MGM Cotai complements MGM Macau well. "MGM Macau is what we call classic. It has a great sense of Portuguese Chinese influence and MGM Cotai is a pure celebration of China's modernity." As Chinese consumers are leading global consumer trends, especially with their digitalization lifestyle, Bowie said MGM Cotai is built around the understanding of Chinese consumers' "connectivity". From the four-story-high LED light featuring videos of well-known Chinese mountains and rivers, the 28 imperial carpets from the Qing dynasty hanging in the hotel lobby, or the QR code attached to its art works around the building that lead consumers to its website with more information of the art piece, such designations speak volumes about the casino operator's goal of winning over a wider spectrum of Chinese clientele. "Everyone says Singapore will cause us problem. It didn't. Everyone says the Philippines will cause us problem. It didn't. Other jurisdictions will try to compete, but it's almost impossible for anyone else in the region to create the infrastructure, the quality and diversity of resorts like here in Asia," Bowie said. "If you look at all the six big casino players in Macao, we're actually pretty good at what we're doing."